The Digital Age is not new or alien to the financial services industry. When the new breakthroughs of information and communication technology (ICT) hit the world in the early 1960s, it was the financial services industry that embraced them before any other industry. It was done as a necessity rather than as a passion or fashion. The necessity arose from having to cope with the strict competition that engulfed financial services institutions cutting into the thin profit margins and thereby threatening their survival after a long run. At the same time, objectives like inclusive financing needed them to have a wider outreach without increasing costs. The industry could not do so relying on the prevailing production model. That model had been based on having a larger geographical coverage with a wide branch network. However, such a branch network required these institutions to employ more people at increasing costs. Thus, the embracing of ICT breakthroughs helped the industry to cut costs, provide better and more efficient services to customers and have a wider outreach without increasing costs. Empirical studies have found that application of ICT has had a positive impact on banks’ profitability. The improvement in profitability should come from the benefits which the customers, banks and employees should receive from the application of ICT as an integral part of the operation of banks. The McKinsey Global Institute, in a report published in September 2016, has highlighted that digital finance could serve the downtrodden in society by providing access to credit and savings products. 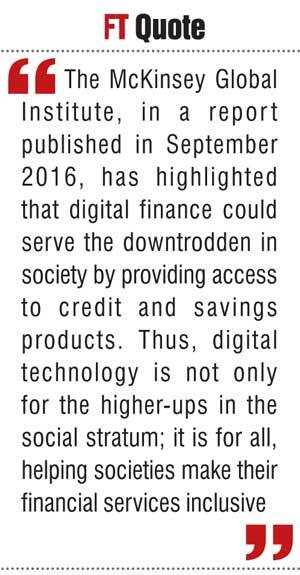 Thus, digital technology is not only for the higher-ups in the social stratum; it is for all, helping societies make their financial services inclusive. After the liberalisation of the banking system in 1977, banks in Sri Lanka too embraced digital technology, albeit at a slower pace. It is the foreign banks which provided the digital services to their customers in the initial stage. They were soon followed by private commercial banks which also invested heavily in ICT infrastructure as well as in ICT-based human capital. The state banks were the last to enter the field but managed to accomplish the task within a few years. As a result, all commercial banks in Sri Lanka today are unibanks providing services to their customers from any of their branches located throughout the country and offering a gamut of internet banking services to them from any part of the world. Starting from basic automated teller machines or ATMs which functioned as cash dispensers and cash deposit accepting devices, Sri Lanka’s ICT-based banking is now providing to their customers all the advanced services which banks in the developed world are providing to their customers. Yet, ICT does not stay in a single place and is subject to constant evolution and improvement. In this sense, banks are lagging behind in the application of ICT compared to other industries like healthcare services or defence services. The challenge for banks today is to narrow this gap by catching up with other fast ICT users. The challenge faced by Sri Lankan banks was discussed by this writer in three previous papers on the subject published in the Annual Proceedings of the Association of Professional Bankers. In the first paper in 2013, it was argued that the banks should take cognizance of the emerging technological advancements not only in ICT but also in other areas. Technologies such as nanotechnology and 3D Print Manufacturing have changed the production bases in economies worldwide. On top of them, the developments in distributed artificial intelligence or DAI in ICT field have posed the problem of choosing between machines and men for providing the services. It was pointed out that DAI will force banks to replace human capital with digital capital. Such a policy would be necessitated by the emergence of a new customer base consisting of the tech savvy young generation called Generation Y or e-Generation. The paper concluded that banks have to modernise their services with appropriate technology and it required them to think beyond economic growth. In the second paper in 2014, it was argued that the retail banking landscape has been changing beyond comprehension. In delivering retail banking services to customers, the traditional bank branch has now become irrelevant; instead, branchless banking has come to the fore. With the whole of society becoming digital, banks would not be able to remain oblivious to digital banking. Customers in Generation Y are now called 3.0 customers demanding all banking services through digital technology based banking. Hence, it is imperative for banks to become 3.0 banks with facilities for interacting with customers through the cyberspace. It was argued that banks should use their databases of customers proactively to promote business and provide a better service to them. It required banks to invest heavily for making their personnel ICT literate and help them to update their skills on a continuous basis. The third paper published in 2015 argued that innovation and creativity in banks are a must for both survival and future prosperity. New knowledge is created through inventions but they should be followed by innovation – the process of converting inventions into commercial production. The whole process goes through four stages: invention, innovation, diffusion and imitation. A proactive Government should facilitate these four stages by creating an environment conducive for innovations to sustain themselves. Spending more on Research and Development, protection of property rights, observance of the Rule of Law and maintenance of law and order are some such requirements. It was also argued that researchers should be linked to industry in order for innovation to take place. Sri Lanka has been successful in creating a literate society compared to its peers. But what is needed is not mere human capital but creative capital for the country to harness the best results out of new innovations. The digital age has offered opportunities to financial institutions. At the same time, they have posed threats and challenges too. One such challenge is the emergence of digital currencies – known as cryptocurrencies – threatening to displace banks as institutions with monopoly power to make payments within as well as across national borders. This paper will examine the evolution and economic rationale of digital currencies, their potential and weaknesses and finally how banks could cope with the challenge. In the discussion, special attention will be paid to Bitcoins, a cryptocurrency that has invaded the payments systems throughout the globe, while functioning as a speculative investment instrument. Part I of the paper will review the failure of the currencies issued by governments and the demand for alternative currencies. Part II will examine the development of Bitcoins as a new alternative currency and its merits and weaknesses. Part III will be devoted to presenting the way out for banks to cope with the problem of becoming irrelevant as payment system managers. Part IV will present a summary of the paper and the main conclusions drawn from its analysis. The physical coins used in transactions have a long history going back some 10,000 years. Yet the paper currency as we know it today was a creation by the Chinese in the 12th century CE. It soon spread to the rest of the world because it was economical, convenient and carried its value through king’s fiat. However, since the production cost was low and kings’ ability to create paper currency was unrestrained, the power to create paper money was abused by kings themselves. The result was the decline in the value of the currency notes over the time eroding the real value of wealth held by people. The first evidence supporting this proposition came from the country where paper money was created, namely, China. As reported by Kenneth Rogoff, one time Chief Economist at IMF and now academic at Harvard University, in his 2016 book titled ‘The Curse of Cash’ quoting Gordon Tullock and historical price data relating to China, between 1260 and 1330 CE, the stock of paper money in China has increased from 0.36 million ounces to 116.4 million ounces. During this period, the price of rice in China has increased from 600 ounces of paper money per unit to 34,000 ounces per unit. This trend has confirmed the mainstream economists’ view that there is a direct link between money in the hands of the public and the inflation rate. The long-term link between inflation and money led the Nobel Prize winning economist, Milton Friedman, to pronounce in his 1963 book ‘Inflation: Causes and Consequences’ that “Inflation is always and everywhere a monetary phenomenon.” It is needless to say that when prices go up, the real wealth held by people get eroded. The historical evidence relating to abuse of money printing powers by governments prompted the Austrian-American economist Friedrich A. Hayek to pronounce in a book published in 1976 under the title ‘The Denationalisation of Money’ that the power to print money should be taken away from the kings and handed over to public. Though Hayek’s view on allowing the private sector to produce their own money was challenged by later day economists, the central idea he had presented that the governments have tended to abuse this power had remained unchallenged. Kenneth Rogoff has taken Hayek’s central view to a logical conclusion in his ‘The Curse of Cash’ referred to above. 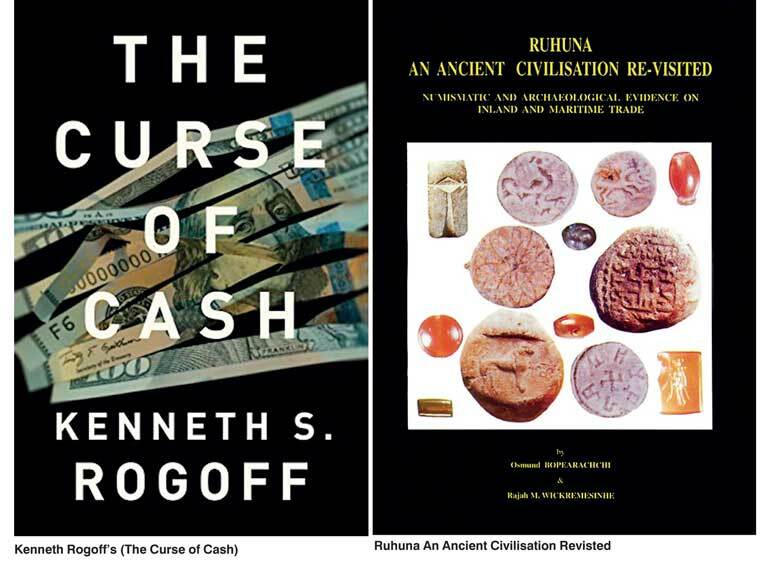 In this book, Rogoff has proposed to phase out the high value paper currency because the high value currency notes have enabled the governments to earn unnecessary profits – known in economics as seigniorage or the profits earned by kings by issuing currency notes for a higher denomination than their production costs – and the underground economy to thrive in societies. This is evident from the high percentage of large value currency notes in the total currency issue across the world. In Sri Lanka, according to the data published by the Central Bank, about 50% of the total currency in the hands of the public consists of Rs. 5,000 notes. Currency notes of Rs. 1,000 and above have a share of over 85%. This high percentage of large value notes, according to Rogoff, finances the underground economy, promotes money laundering and tax evasion and facilitates bribery and corruption. Hence, his prescription has been to allow digital currency to thrive and allow only the paper currency of small denominations in the initial stage but to be replaced by coins eventually. But digital currency would pose a challenge more as competitors to other financial instruments and institutions than to paper currency itself. Hence, it is the banks which are at the receiving end when digital currencies – also known as cryptocurrencies as mentioned above – take over the world. The currency issue need not be a government monopoly as has been demonstrated by ancient Indian and Lankan practices. During the 4th century BCE in ancient India, there were private money producers who produced money along with the king. Kautilya, the ancient Guru on economics who wrote the first treatise on economics called ‘The Arthashastra’, recommended to the king that he has to maintain the value standards of such private moneys subjecting them to prescribed quality standards. To ensure the prescribed standards in privately produced coins, he recommended the appointment of an examiner of coins. This ancient Indian coinage practice would have been common in this part of the world as presented by Osmund Bopearachchi and Rajah Wickremasinghe in a book published in 1999 under the title ‘Ruhuna: An Ancient Civilisation Revisited’. Accordingly, a large number of coins had been found in the Southern Kingdom of Ruhuna of Lanka belonging to the period from 3rd century BCE to 1st century CE. They had carried the Brahmi inscriptions of private issuers, among many, the like ‘Of Gutta’, ‘Of Pussa, Son of Householder Dutaka’, ‘Of Lady Sama’, ‘Of Municipal Officer Nakati’ or ‘Of Lady Uttama, Householder’ and so on. Even in the modern period, before the governments took over the monopoly power of issuing currency, paper money was issued by banks or private parties in the form of monetary obligations written over pieces of paper. In the next part, we will look at the development of a leading cryptocurrency today, namely, Bitcoin, and its implications on banks and central banks. (This is a revised version of a paper published by the W.A Wijewardena at the 28th Annual Convention Publication of the Association of Professional Bankers of Sri Lanka in November 2016. The author can be reached at waw1949@gmail.com).